Osmanthus Jelly is one of the cold desserts I would top on after a hearty meal in a Cantonese restaurant. This dessert is usually served in Cantonese restaurants. However, each time I made an order for this dessert, I would surely feel a pinch for my wallet. A small piece usually costs few Singapore dollars. Why would I want to pay so much for a small piece of jelly despite the fact that this is one of my favourites? I am determined to go austerity. Let’s make it myself. 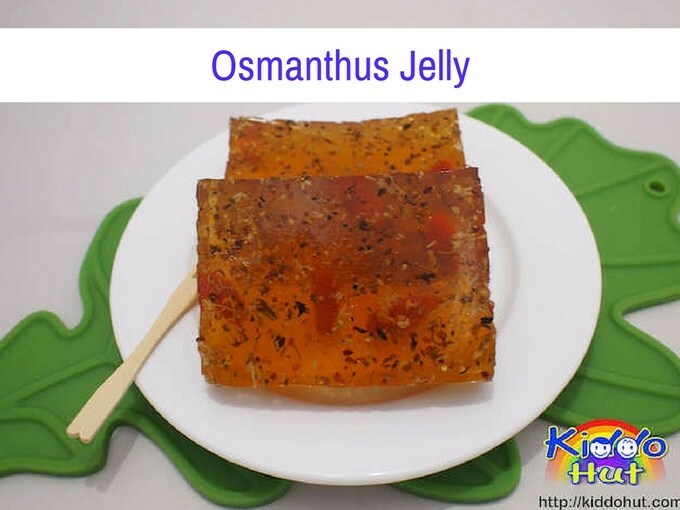 Usually, Osmanthus jelly would add the Chinese Wolfberries for the sweetness and health benefits. Chinese Wolfberries too have many health benefits. Beside being one of the most antioxidant-rich fruits, they are believed to be good for vision. In the Traditional Chinese Medicine (TCM), the wolfberries are believed to promote youthful-looking skin and improve blood production. They are often used in TCM remedies to reinforce the liver, invigorate the kidneys and replenish the vital essence. I have tried many Osmanthus Jellies in several restaurants and love the one from Tim Ho Wan but theirs I personally find too soft. So, I tried using different ingredients and amount of water to get to the texture and sweetness. I have tried using different brands of agar-agar powder and different amount of water, as well as using Chestnut powder. Finally, I realise it is the Gelatine powder that gives the texture. On the sweet aroma, I need to brew the Osmanthus and Wolfberries into tea first. For the sweetness, I used mix of brown sugar slab and honey rock sugar. There are some health benefits to use honey rock sugar and it gives some honey fragrance. I have tried using pure honey but somehow the taste is just different. Try this recipe, it is really easy! 1. Cut the brown sugar slab to small pieces. 2. 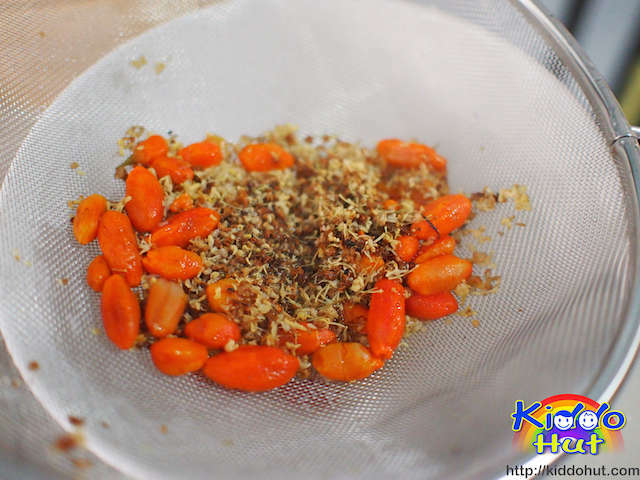 Add in the dry Osmanthus and Wolfberries in hot water and brew for 30 minutes. 3. Strain the Osmanthus and Wolfberries, and retain the tea. 4. Put the rock sugar and gelatine powder in the tea and cook under medium-low heat. Stir. 5. After sugar has dissolved, remove from heat. Add in the Osmanthus and Wolfberries. 6. Pour the mixture into the moulds and let it cool at room temperature before put in fridge to set. To ensure the Osmanthus doesn’t sink at the bottom, stir when the mixture is close to set. Alternatively, after the jelly is cooled, put the tin in a pot of ice to set and stir when it is about to set. Hope you enjoy this dessert! General and Health Disclaimer: No information, ingredient or product mentioned on this site or post is meant to diagnose, treat or replace any medical professional medical advice. This is a personal blog post, mainly to share personal experience and does not take any responsibility for the medical treatment and suitability of the ingredients or product/food for you and your family. Please consult your doctor before using any of the ingredients or products mentioned herein. Hi Lilian, would like to check the type of gelatin powder you used. Hope to hear from u. Thanks. The gelatin powder is in container that looks like the Bake King 100g baking powder which is available at major supermarkets and baking stores including Phoon Huat. It is made from fish or beef. When do you put the brown sugar and rock sugar? 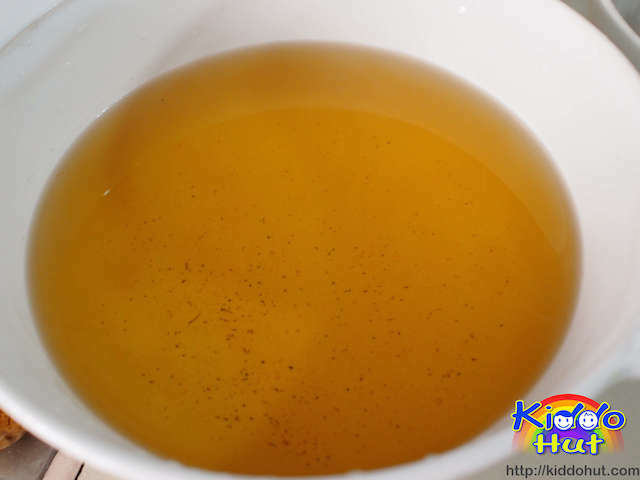 Brown sugar is added when brewing the osmanthus tea, and the rock sugar is added together with the gelatine.